With each passing day, history is made somewhere by someone so it’s often interesting to look back on what your beloved football team has done on this day in history in years gone by. Read on to find out what happened when the Swans played on August 10th in previous years. 6 years ago – The Swans recorded their first win under Brendan Rogers as they beat League Two Barnet 3 nil at the Liberty Stadium in the Carling Cup 2nd Round. The 6,644 crowd watched the Swans ease to victory with goals from Cedric van der Gun, Darren Pratley and Shefki Kuqi. 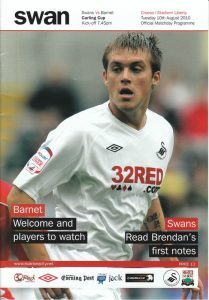 12 years ago – The Swans recorded their first win of the 2004/2005 season as they won 2-0 at Rochdale in League Two, thanks to a goal in each half from Kevin Nugent and Andy Robinson in front of the 2,514 crowd. Perhaps the biggest suprise of the evening, was Kenny Jackett dropping captain Roberto Martinez from the squad – a gamble which obviously paid off! 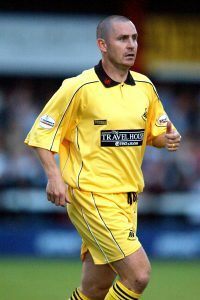 14 years ago – An injury time equaliser denied the Swans all three points against Rushden & Diamonds at the Vetch Field in League Division Three. The 6,327 crowd enjoyed an eventful afternoon, as a James Thomas goal brought the Swans level, before a 25 yeard second half strike saw Paul Reid score his first goal for the Swans to give them the lead. To round off an afternoon of mixed emotions, Swans captain Kris O’Leary was later sent off for a bad tackle on Onandi Lowe. I was there for the league games mentioned. I don’t know about the cup maybe for that? I still follow Swans every home league match and cup if it is a big team.